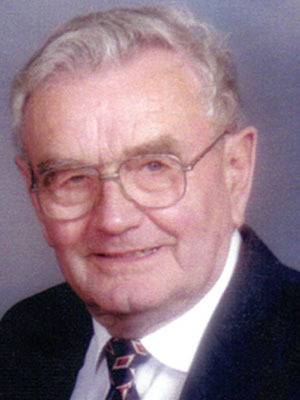 Vernon E. Gerdes, age 94 of Jordan, passed away with family at his side on Friday, April 5, 2019. A visitation will be held Saturday, April 13, 2019 from 9:00-10:45AM with a Christian Funeral beginning at 11:00AM, all at St. Paul Lutheran Church, 100 6th St. W., Jordan. Vernon will be laid to rest at Spirit Hill Cemetery with Pastor Jeremy Glowicki presiding. Pallbearers will be Vernon’s grandchildren, Matt, Mike, Mallory, and Nick Gerdes and Vernon’s nephews, Bruce Gerdes and Richard Baumann. On October 3, 1924 in Belle Plaine Township, Vernon Emil Gerdes, was born to parents Emil and Ella (Holste) Gerdes. Growing up during the Great Depression left a lasting impact on Vern. It taught him the value of hard work, frugality, and the importance of family. Vern cherished his memories with family—hearing his mother singing hymns and working alongside his brother & sisters on the farm. In his youth, Vern spent countless hours biking. Whether going into Belle Plaine for religion classes or to the District #35 country schoolhouse, Vern bicycled everywhere. Occasionally, Vern biked towards Jordan to visit Dorothy Trost on her family’s farm. In April 1946, they went roller skating on their first date. It wasn’t long before they exchanged wedding vows at St. Paul Lutheran Church in Jordan on February 7, 1948. After graduating from Belle Plaine High School in 1942, Vern continued working on his family farm. Once married, Vern and Dorothy took over the Trost farm, just south of Jordan, where they lived for over 50 years. While dedicated to the farm, Vern always made time for family, friends, and his community. Vern loved spending time with his grandchildren—they were his pride and joy! He enjoyed holidays with relatives, picnics, seeing an occasional movie, attending the MN State Fair, and taking day trips. One of Vern’s favorite trips was to Charles City, IA to see the Oliver Tractor factory. Once retired, Vernon and Dorothy traveled to Germany, Hawaii, Puerto Rico, and Alaska. No matter where they traveled, Vern always had his camera ready! Whenever a friend or fellow farmer needed a helping hand, Vern was there. He was always building or fixing something. Often, he got together with friends to play Euchre, Sheepshead or Pinochle. Vern served as clerk for St. Lawrence Township for 27 years. He was also a member of the Farm Bureau and served as president. For six years, Vern was a trustee on the St. Paul Lutheran Church Council. He was a hardworking and thoughtful person. Vern will be missed by his wife, Dorothy; children, Sharon Westcott, Bev (John) Pehkonen, Wayne (Elaine) Gerdes, Lyle (Sue) Gerdes; grandchildren, Matt (Ashley) Gerdes, Mike Gerdes, Mallory (Dyllon) Gerdes, Nick (Jenny) Gerdes; sister, Carol (Joe) Hall, brother, Marvin (Donna) Gerdes; many nieces, nephews, other relatives and friends. Vern is preceded in death by his parents; sisters, Adella (Lawrence) Ernst and Arlina (Harold) Baumann; infant brother, Clarence; infant twins, Leland and Leona. I’m so sorry Dorothy and all your family.